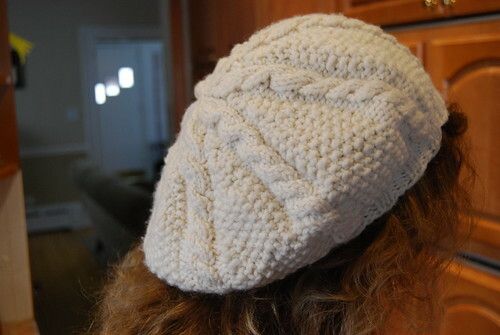 I made this hat with a heavier weight yarn and size 7 needles and made it too slouchy according to my dd who was the recipient Christmas morning - I personally like it, but ripped back (5" instead of 8" before the decrease) I initially made mine on dpns so I split the pattern on to 4 needles (4 very crowded needles) where the 2 purl stitches start before the cables. My first attempt at decreasing (the now too slouchy version) I just made up my own decreases but being that this is the second go-around, I figured I'd try to stay true to the pattern. I'm wondering, where did you place the markers? This is the pattern I've been looking for!!! I'm casting off now! As quick as this project was to knit, the cast-off is exactly opposite that. But it looks worth the effort so far. I'll post pics when it is done. Just jumped over to yahoo and there is some good info there. Someone even wrote out a chart based on the written instructions, which are different than Jared's chart. 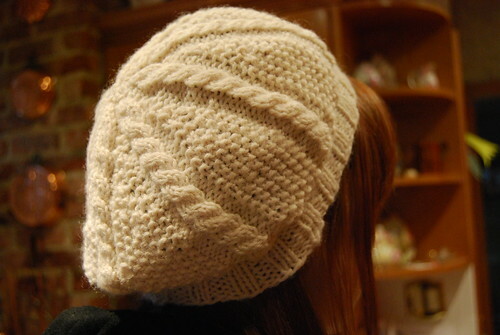 i really need to get yarn and (long) needles and get started on this. Thanks for letting me know about the row 55 info. I missed that. So I have about 16 rows left. I'm a little nervous about jumping off the written instructions and on to the chart. I love charts, but his chart starts in the middle and you really don't want to come up one short or extra after 300 + stitches in a row. I might decide to write them out and continue with a written out pattern. Did he add extra chart lines? I've been using the written instructions and it seems it stops somewhere around 3/4s of the way into the pattern. BTW, I'm almost done with the written instructions, Yay! The forward slash corresponds to a knit 2 together, and the backslash is a slip one, knit one, pass this slipped stitch over the one you just knit. It corresponds to the writen instructions for the doily from row 47 on, although for any of you out there who are up to that part, I have some questions about how the chart relates to the written instructions, so give me a shout out!